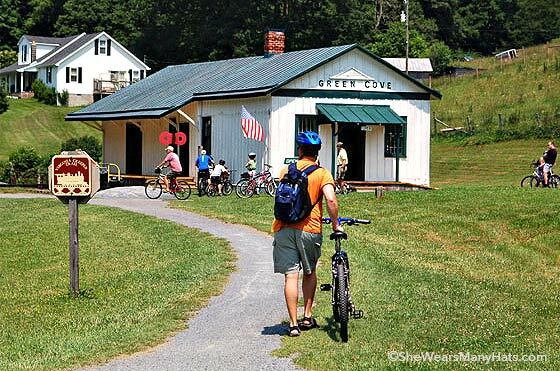 A few years back, when some friends invited us to join them on a bike ride on The Virginia Creeper Trail, I was, you could say, a little apprehensive. Why the concern though? I grew up riding bikes – I practically lived on a bike when I was younger. I remember my most favorite bike. It was purple (’cause Donny Osmond’s favorite color was purple) and it had a cool headlight, which didn’t last long because right after I got it I crashed into our garage door… but who needs a bike headlight when they’re 8? 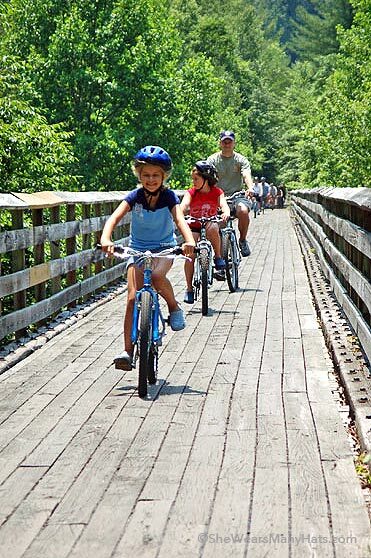 The Virginia Creeper Trail is a trail that runs along an old train bed in the western mountains of Virginia, near the TN and NC borders. There are many trails like this throughout the U.S.
“We can take our time and do half in a day,” said my beloved friend. “It takes a day to do half? How long is it?” I inquired. “About 17 miles,” she said. “So we’ll do half of that – about 8 and a half?” I replied. “No, seventeen is half–the whole run is 34 miles. The other half is more strenuous. We’ll do the easy part, and like I said take our time. 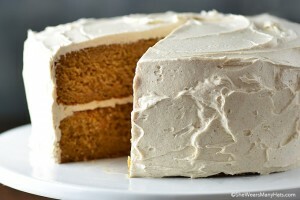 And we can stop for chocolate cake,” she convincingly retorted. “Yeah, chocolate cake, hamburgers, fries. It’s easy. It’ll be fun,” she closed the deal. Bike. Eat cake. Bike. I can do that, I thought. This particular trail, as before mentioned, is 34 miles long. You can start at either end or in the middle. We chose, again, as before mentioned, the easiest route: Whitetop down to Damascus. And, I’ll have to say, it was easy. And fun. The trail “creeps” (thus the name) down the mountain along the Whitetop Laurel Creek. 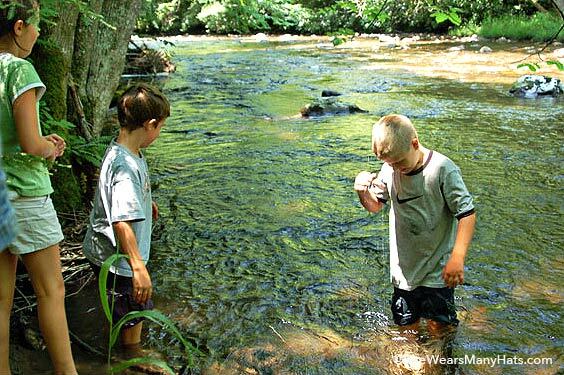 Of course, I thought we’d never make it to my own personal destination, now formally named “Chocolate Cake,” because we stopped almost every 1/4 mile to play in the creek and explore. You’ll even find a playground, restrooms and snack places on the route. Chocolate Cake is about mile 10 at The Creeper Trail Cafe, I think. The chocolate cake I speak of is in this building below here … the cake didn’t last long enough to get a picture. The ride is mostly shady and scenery abounds. And believe me, if I can do it with my big hiney, you can. Just be sure to ask for a “big hiney” seat – seventeen miles is a long way for the bottom if you’re not used to cycling. 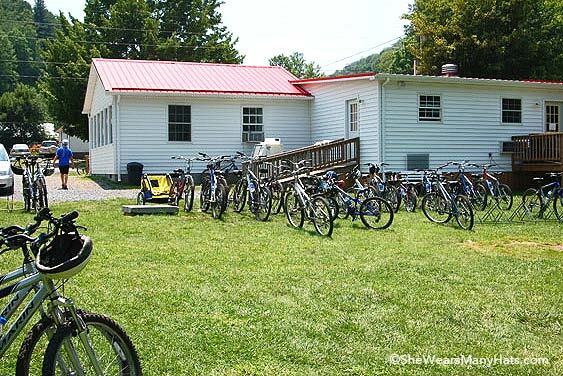 The local outfitters rent all kinds of bikes for all ages as well as other gear. 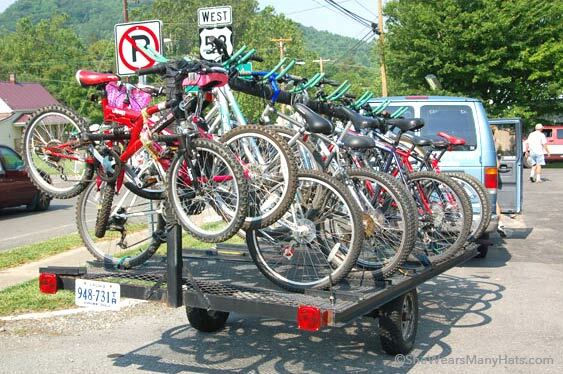 Of course you can take your own bikes if you’d like and just pay for the transport. 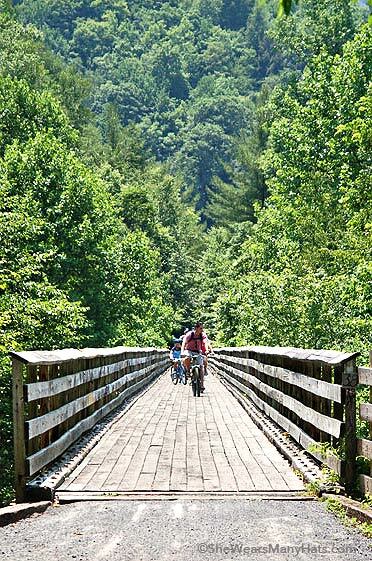 We’re blessed to have The Virginia Creeper Trail close by, but there are many other fantastic bike trails nationwide that were formerly train beds and have been converted to trails for biking, hiking and even rollerblading. You can read more about these and about the Rails to Trails program at www.railstotrails.org where you’ll also find national maps and other information. Have fun and remember to save room for the chocolate cake! I love the Creeper Trail! We just did it again this past May. It was a bit wet this time but still had a lot of fun and fellowship along the way. Can’t believe how little the kids look in the pics. Time flies. We’ll have to do it again sometime soon..
We may try to go in Oct. sometime. Wanna join us? Do they have a buggy that fits behind the bike? The scenery is so pretty I’d best not be peddling (that is even if I could) or I would end up off the trail. 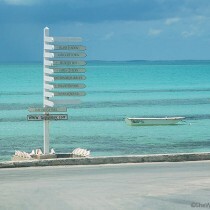 I would be too busy looking at the scenery and not where I’m going. Your photos are just beautiful. What good memories for all of y’all. Thanks for sharing them. I am ready to go. 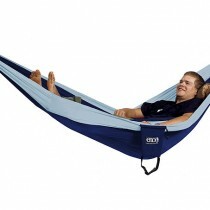 I bet it is beautiful in the fall. So gorgeous, I wish we had scenery like that in So. california. 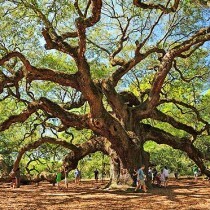 We should make a group trip out of it. It’s so much fun. We’re thinking about going in the fall. Oh my… we love Whitetop Va! When Kendra was 13 she went on her first Mission’s Trip there and then for several years after. Kate and I went one summer and had the best time. 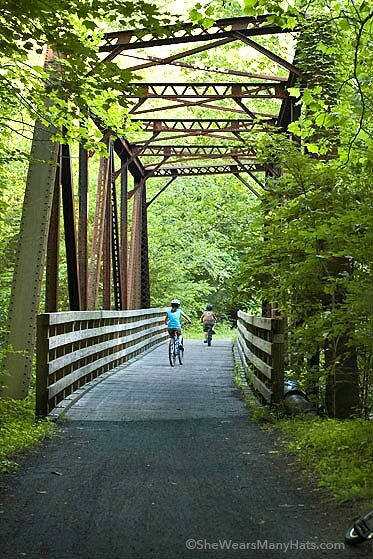 It is absolutely gorgeous and we all want to bike the trail! Let’s Go! 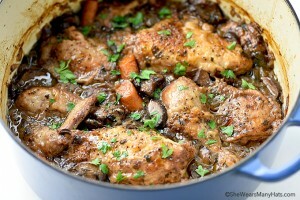 I just found your blog through Pioneer Woman and I am loving it! I am enjoying going back through your archives. I was delighted to find this post on the Virginia Creeper Trail. We live in Ohio, but we were in Virginia in 2007 for a family wedding, and 5 of us took a day trip on the Creeper Trail. We fell in love and wish it was close to us in Ohio! It was so fun to see your photos that look like my photos (only yours are much better). I have a photo of the same bridges, and of course those red barns. 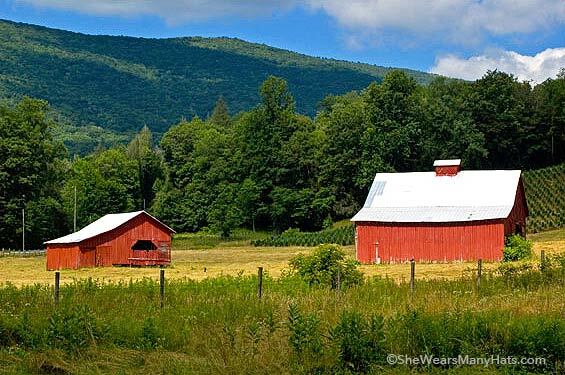 It makes you wonder how many folks across this great land have photos of those same red barns? Kinda gives me chills. Anywho, I’m so glad I found your blog, and I am now a subscriber! This is actually on my list of places I want to take the kids this fall. I’m newish to cycling (despite my years on a bike as a kid, my rear reminds me every time I ride) and my kids don’t have the stamina for anything long without a lot of breaks, so this sounds perfect.